Recently, while searching for information about Henry Campe, I stumbled across something that flabbergasted me. According to Thomas, Henry Campe established his liquor business in 1862, doing business as a retail grocer and liquor dealer located at the NW corner of 2nd and Tehama. 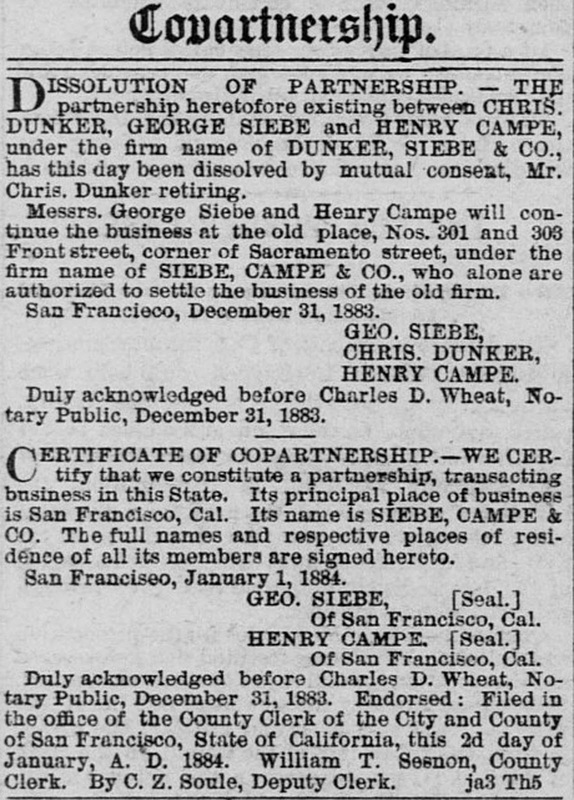 In 1883, he partnered with a George Siebe (no relation to the Siebe / Rosedale brand) and established Siebe, Campe & Co.
Again, according to Thomas, this firm hung around until 1887, when Henry went it alone as Henry Campe & Co.; a firm that prospered and lasted through to prohibition. 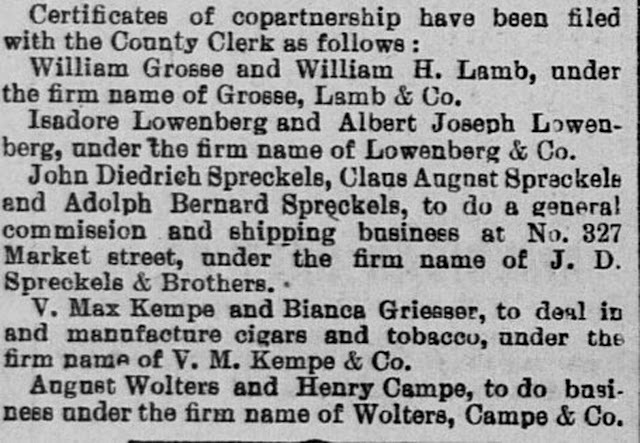 Thomas states that Henry Wolters entered the liquor business in 1872, locating the business at Third & Market Sts. in San Francisco. He was in partnership with Charles S. Fecheimer. In 1874 he notes a move to 221 California St. A slug plate glop top 5th attests to this location. August Wolters replaced Fecheimer sometime around then and the name Wolters Bros. was introduced. In 1880, Henry partnered up with Edward Bumstead after Bumsteads split with Fenhausen. The name was changed again and was then known as Wolters Bros. & Co. (I note a discrepancy there because the California St. slug plate is already embossed "& Co.") Sometime in the mid to late 80's, a new mold was made that reflected the move to 115 & 117 Front St., S.F. That firm hung on until 1896. By late 1896 the address was vacant and no more mention is found of Wolters Bros. & Co. The western wholesale liquor industry of the 1880's and 90's really was a tangled web. Wolters and Campe; what a combination. Makes one wonder if there's a bottle out there somewhere? And what type of branding was used?